Constructed in the reign time of Empress Wu Zetian in the Tang dynasty, this is a hall cave with a truncated pyramidal ceiling. The ceiling center features a large medallion surrounded by the draperies of twisted vines and half medallions that extend to the four slopes covered with the thousand Buddha motifs (a part of the south slope is damaged). The central Buddha is the original Early Tang work, the other statues including disciples, bodhisattvas and guardian warriors were all renovated or repainted in the Qing dyansty. The arch ceiling of the niche is decorated with double-layered railing against which is a row of bodhisattvas looking downwards. Behind them is the vast sky with apsaras, clouds, flowers, palaces, and fairy ladies. The sutra illustration on the south wall was first identified as that of the Lotus Sutra and finally as that of the Ten Wheel Sutra, which this text adopts. This sutra is mainly about the belief in Ksitigabha bodhisattva and it consists of four parts respectively on Ksitigabha, on the Ten Wheels, on the Period of Termination, and on the Six Perfections. In composition, the sutra illutration is largely divided into four areas: 1. the center for the preaching scene; 2. the middle of the west side for the salvations of Ksitigabha; 3. The upper part of the west side for the manifestations of Ksitigabha (some scenes are rendered on the upper of the east side), according to the sutras, Ksitigabha has fouty-four manifestations; 4. The east side for the Candala of the Kshatriya class (The Jataka of King Elephant is on the west side in this area). The north wall was completely occupied by the Amitabha sutra illustration. In the center is the preaching scene of the Buddha and on two sides are bodhisattvas listening to Buddha's preaching. The architecture in this illustration is very special. Above the water are platforms and two side corridors, the pavillion with an east Asian hip and gable roof consists of two storeys, three jian in depth and three jian in width. There is no eave under the flat base of the upper storey. This kind of depiction is only seen among the Early Tang paintings.There is no window or wall between the pillars of the upper and lower storeys, which is replaced by the hanging curtains. The ground of the platform is paved with flowered tiles, similar to the customs of the Tang dynasty. On the space above the east entrance is a preaching scene, and on either side of it is a preaching scene of a seated Buddha. The south side of the entrance contains a standing Buddha and two bodhisattva in the center and a row of male donors of the Five Dynasties below (obscured). The north side contains a eleven-headed Avalokitesvara illustration in the center, and a row of male donors painted in the Five Dynasties (obscured). On the lower parts of the north and east walls in the main chamber are male donor figures, most of them have been obscured. Judged from the numbers in the surviving inscriptions, people who sponsored the construction of this cave were mainly from the Zhang, Lihu,and Cao families. On the tent-like ceiling of the corridor are part of a parasol and a desk painted in the Five dynasties. The north and south slopes are decorated with hanging draperies.On the tent-like ceiling of the corridor are part of a parasol and a desk painted in the Five dynasties. The north and south slopes are decorated with hanging draperies. A hell illustration was rendered on the south side of the entrance in the west wall of the front chamber (which was revealed in 1965 by removing the surface layer of paintings), and on the north side beneath the Five Dynasties paitnings are traces of the Early Tang murals. The south wall is covered with a Samantabhadra illustration (imcomplete) and the north wall with the Manjusri illustration (incomplete). 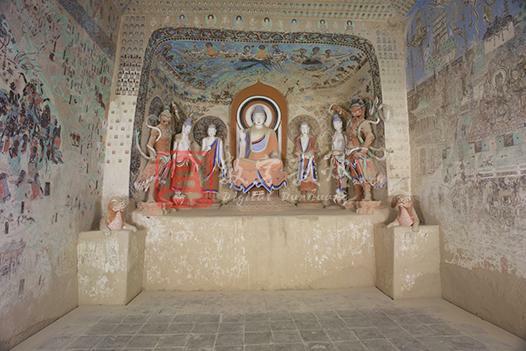 ：On the south wall is an illutration of the Ten Wheel Sutra, which is rare among Dunhuang murals. It mainly disseminates the faith in Kistigabha bodhisattva in detail. In composition, it can be divided largely into four areas: I. In the center is a preaching scene and around it are scenes of the assembly on Mt. Khadiraka, beauties above the Buddha; the two hands symbolizing Kistigabha holding a pearl from the clouds, Assembly of the Buddhas from ten directions, and bodhisattvas or celestial gods asking questions to the Buddha, three disciples attending the assembly on behalf of the Buddha, and etc. II. The middle part on the west side, the scenes of Kistigabha saving people from disasters were intended to show that if one recites the name of Kistigabha, he or she will have sufficent food and drink, has his or her desire satisfied, be happy, be free from getting sick, being saved from the prisons, water, fire, or from falling from the cliff to death. III. The upper part on the west side shows various manifestations of Kistigabha (some of the scenes are rendered east upper). According to the sutra, ksitigarbha has fouty-four manifestations and can manifested as a three-headed, six-armed god sitting on a Sumeru throne, a four-armed god sitting on a Sumeru throne, a bodhisattva seated with legs pendent, a Dhyana god, a god talking, a god with palms joined, two gods with palms joined facing a six-armed god, standing images of four lokapalas, a preaching bodhisattva, a dhyana god, a bhiksu sitting in meditation, or a Cakravartin, a common standing khattiya, a naked walking Sudda or Vaisya, or a man, a woman, god, six-armed god holding the sun and moon in hands, running naked man, a lion, an elephant, a horse, a bird, Yama, an officer in the hell, a ghost, a lay person, a fierce dog or a jailer. IV. The east side, stories of Candala are rendered (the Jataka of King Elephant is on the west side), which are mainly are: 1. scenes in the Period of the Termination: three persons hunting in the wild; in a yard, a person carrying a dead animal, two men fighting, and a men bowing to a womon; a bhiksu stretching his arms to a women in a room; in a room a old man sitting on a bed, a person leaning on a stick in front and two maidservants waiting on, looking like treating a patient; a bhiksu descending on a cloud and looking downward above the roof; 2. march of armies: the army of soldiers riding horses to the front, a rider in front led by a layperson and welcomed by three naked people; 3. the Jataka of King Elephant: two elephants on the one side of the mountain and five bhiksus on the other side, the one in the front drawing his bow for a shoot, a large square inscription (obscured) is between the elephants and the bhiksus; 4. stories of King and the criminals: painted in the lower left corner. Inside the towering city wall, there are many people in the temple hall (more than 30 persons). A man rides a horse out of the city gate with a parasol; 5. a Candala annoying the master: below the central preaching scene, a master sitting on a high throne, two bhiksus and two lay Buddhists sitting on two sides, a man standing in the front with half naked chest talking to the master; 6. sin of oil extraction: two women are making somehting; 7. Accumulating merits by giving alms to monks, lighting lamps, building houses, healing patients, reciting sutras, and building (two) pagodas. The lowest paintings are obscured and part of the ground layer has fallen off. The north wall is occupied by the Amitabha sutra illustration. The Amitabha sutra, also known as the sutra on the indefinite life (Aparimitayur-sutra), mainly discribes various majestic, quiet and auspicious scenes in the western pure land. Ten apsaras fly in the blue sky gracefull. The Buddhas and bodhisattvas attending the assembly on clouds represent the Buddhas of the ten directions and the bodhisattvas attending the preaching of the Buddha of Indefinite Life (Amitayus Buddha), which are rendered symmetrically in the upper blue sky. There are five grand halls or pavillions housing four groups, each group consisting of one Buddha and two bodhisattvas. Right above Amitabha Buddha is Suddhavasa, where a cloud is depicted, on which is a two storeyed pavillion with seated and dhyana Buddhas inside. Two bodhisattvas stand on the first floor, and in front of the pavillion is a seven-treasured tree, on either side of the tree is a group of one Buddha and two bodhisattva attending the assembly. The whole picture is of symmetrical beauty. The central part describes the Holy Three Ones: Amitayus Buddha sits in lotus position in the center flanked by Avalokitesvara and Mahasthamaprapta who sits with one leg bent and one leg pendent. The other bodhisattvas sit on two sides. above the pond are platforms and pavillions, in the pond are Kalavinka birds, ducks, incarnated boys, mandarin ducks, and lotuses, on the railings stand peacocks. The pavilion with an east Asian hip and gable roof consists of two storeys, three jian in depth and three jian in width. There is no eave under the flat base of the upper storey. This kind of depiction is only seen among the Early Tang paintings. There is no window or wall between the pillars of the upper and lower storeys, which is replaced by the hanging curtains. The ground of the platform is paved with flowered tiles, similar to the practice of the Tang dynasty. In the middle, above the pavillions on two sides are Buddhas and bodhisattvas coming to attend the meeting. It can be regarded as a outing scene of the Buddha with bodhisattvas. The picture below Amitabha contains two musican bodhisattvas standing on small round rugs. On the two sides are some musican bodhisattvas and attendant bodhisattvas. The painting below is already obscured, and a row of male donors of the Five Dynasties can be seen. The ceiling center features a large medallion, the outer circle of which is formed by eight flowers with pedicels and eight small flowers. The medallion has a bud in the center surrounded by eight large flowers with petals like swirling clouds. In the corner of the square center are butterfly-like flowers. Around the medallion are decorative borders of connected pearls, twisted vines and half medallions, different than the parasol-like ceiling center designs. It is rendered in green and blue, on a cinnabar, white or brown ground, creating a bright contrast. The draperies of twisted vines and half madellions extend to the four slopes. Part of the Samantabhadra illustration of the Five Dynasties is survived. Part of the Manjusri illustration of the Five Dynasties is survived. On the tent-like top of the corridor are a parasol, a desk for offerings and medallion patterns repainted in the Five Dynasties. The south and north slope are decorated with the hanging draperies painted in the Song dynasty.